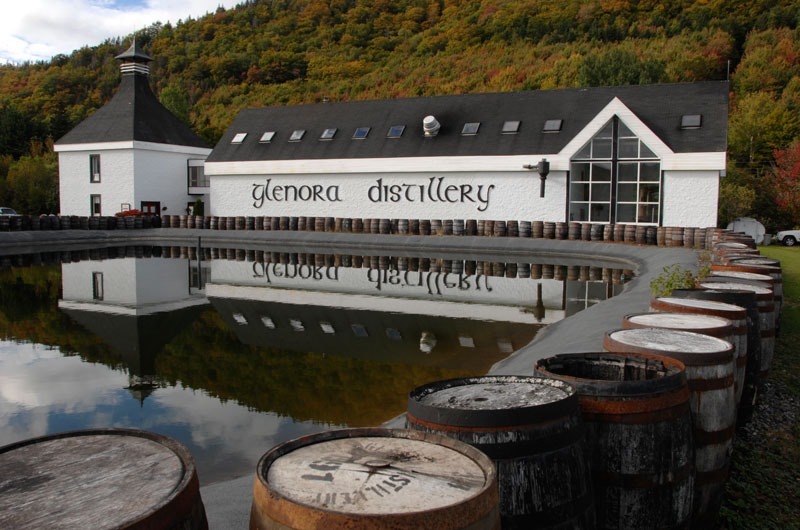 The Glenora Inn and Distillery Resort is situated on a 200 acre site in Glenville, rich in the heritage of its Scottish culture and only a few miles from the ocean and near the highlands of Cape Breton Island. Constructed in traditional style with stone walls and post and beam framing, the Glenora Inn is unique and attractive with nine rooms of high standing. The picture window view from each room brings the quiet beauty of the Highlands into high focus, emphasizing the Inn’s charm and peaceful setting along MacLellan’s Brook. This quiet corner of Nova Scotia is home to birds, wildlife, fish and all the beauty that nature provides. For the hiker, the whiskey enthusiast and the honeymooner, Glenora is an ideal place to visit. Attractions nearby include salmon and trout fishing; horse-back riding; golf; and picnic excursions on a fishing boat. Visit our Specialty and Gift Shop which features gift items produced by local craft specialists as well as a selection of imported Scottish treasure. Sample our Glenora Distillery product to take home as a distinctive souvenir of Nova Scotia. The Glenora Distillery is maintaining the highlands Scot’s tradition of distilling the heartwarming drink “Uisage Beatha” (The Water of Life), and is Canada’s first single malt whiskey distillery. Conducted tours of the distillery are available to visitors, with ample free parking, a picnic area and scenic grounds. Tours operate daily from 9am to 5pm. Our accommodations include 6 chalets with housekeeping facilities (Double, Queen, King), with a 4-piece bath (jacuzzi), and colour satellite television; 9 rooms, with a 4-piece bath. We have a licensed dining room and pub (seasonal hours) and free daily ceilidhs can be enjoyed during the summer months. Meeting facilities for business meetings, receptions, company functions or private parties are available. We are also pleased to accommodate sporting parties for outdoor recreational activities. Visa and MasterCard are accepted. Cancellation Policy: Must cancel 7 days prior to day of arrival for refund of a deposit or avoid a credit card charge. For Packages, must cancel 14 days in advance.